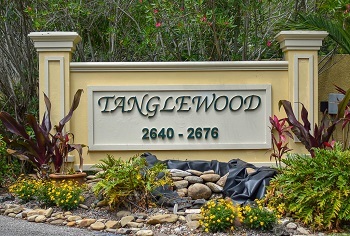 Tanglewood Townhomes is a newer community of three bedroom townhouses located in the popular East Lake section of Palm Harbor, FL. Beautiful palm trees line the sidewalks gracing the neighborhood with a uniform design. Floor plans offer choices of 1600 to almost 1800 square feet of living space with custom amenities throughout. Specific detail is given to the design of these townhouses making ownership in Tanglewood extremely attractive. Granite counter tops, fireplaces, balconies, wood cabinetry, and nature preserve views are just a few of the marvelous features. With homes newly built in 2007, Tanglewood is an attractive neighborhood with low monthly maintenance fees covering such items as trash removal and grounds upkeep. With easy access to Tarpon Woods Golf Course, Lansbrook Golf Course, the Pinellas Trail, John Chesnut park and others, top rated Palm Harbor schools, library, YMCA, Tanglewood is becoming a sought after neighborhood for many. Close to all shopping, restaurants, and just twenty minutes to the sunny beaches of the gulf coast. You can even walk to a nearby shopping center for a quick bite to eat or to pick up a few items. This is a great location and a awesome small community to check out. You will not be disappointed. Selling your home in Tanglewood? If you were interested in selling your home in Tanglewood, contact one of our agents today! We are well known and trusted members of the Palm Harbor Community and would love to help you in the process of selling your home. It doesn't have to be so hard- just call us at Lipply Real Estate and we will make it as stress free as possible for you!